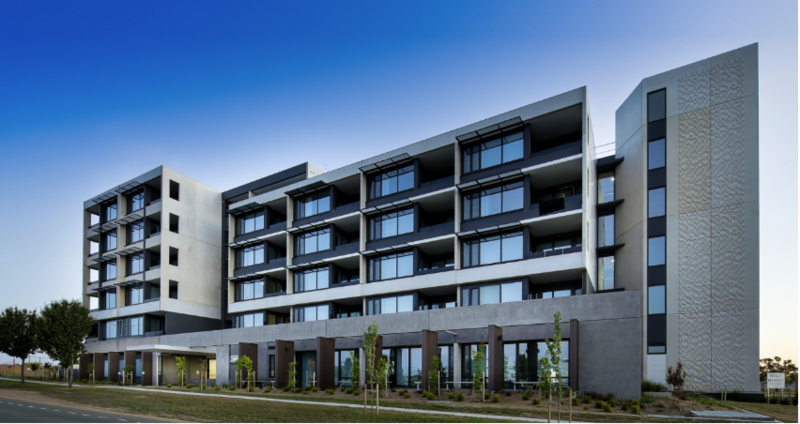 The Common Ground Canberra (CGC) community housing development at Gungahlin is being hailed as a successful new template for addressing homelessness in the nation’s capital. Aside from its social impact, CGC’s architecture has also recently been lauded as the ACT’s top architectural statement for 2017 by a panel of experts on Channel Ten’s Australia by Design series. CGC is an ACT Government-owned asset that has been funded in partnership with the Federal Government, the private sector, community groups and philanthropic donations. With the funding model and intended outcome of the facility in mind, good value for money and a high-quality building were high priorities from the project’s inception. The concrete-framed development comprises 40 single bedroom apartments over a ground floor communal and office spaces. The aim is to encourage social interaction and allow for the delivery of support services for independent living. About half the units are occupied by social tenants sourced from the ACT Housing Register who would otherwise be at high risk of homelessness. The building siting responds to the urban context by reinforcing the corner with a six-storey vertical element, then drops in scale and setback to a five-storey horizontal element along the main frontage. This setback relaxes the public interface and creates a courtyard at ground level for the common spaces to take advantage of the northerly aspect and activate the street frontage. 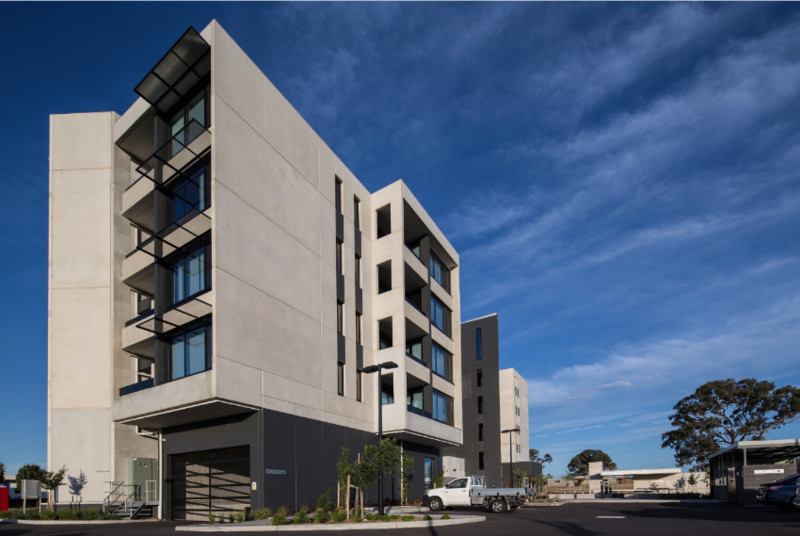 Honed concrete with black oxide wraps the base of the building, providing a solid plinth from which the white concrete blades of the apartments spring. The circulation stairs form towering elements at each end and float away from the building, revealing apertures to the internal corridors behind. While the brief called for each of the apartments to be alike, structural elements have been articulated differently to ensure a varied façade. This is achieved through colour, balcony treatment, sun shading and orientation. The site was generous enough to allow a single-loaded internal circulation. This allows units to achieve a northerly aspect to living spaces and cross ventilation. Combined with high quality double glazing and thermally broken frames, thermal comfort is easily managed. The corridors achieve high levels of natural light and views, and are terminated with small break-out space nodes incorporating planter beds to the east and west as vertical gardens. Opportunities were developed between the design team and precast concrete contractors to develop a construction methodology and design outcomes to create an efficient structural solution and achieve a dynamic aesthetic. The precast concrete package utilises the material as cladding and the primary structural components of the building. During construction, the exterior precast walls were extended to aid safe work practices, minimising the need for expensive scaffolding and increasing the speed and ease of construction. The project includes a number of functional shared spaces, including an outdoor communal kitchen and vegetable gardens, and informal indoor ‘library’ nooks where tenants can share books and each other’s company. In fact, just about every element of the design is purposed to bring the tenants together and reinforce the sense of community that is the driving principle behind Common Ground. In doing so, it underlines the premise that good architecture isn’t just about great buildings, but transforming lives in a positive way.